There are now 4 verified Solar Type stars that have Jupiter size planets in orbit around them. The graphic above summarizes their positions with respect to their host stars. 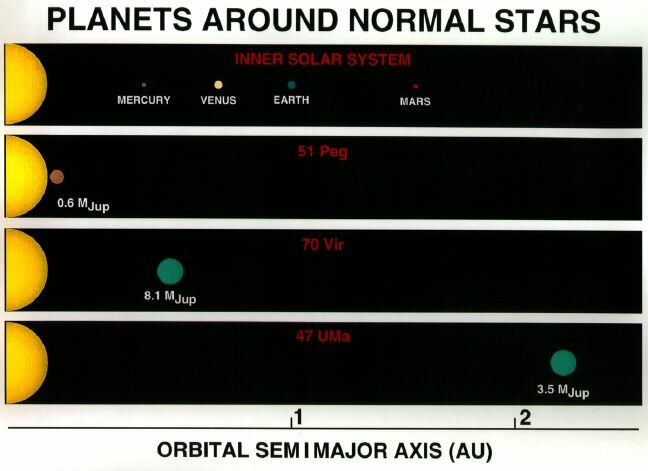 Based on this sample of 4, there appears to be no characteristic separation between the host star and Jupiter-Size Planet. These planets have all been discovered through accurate measurements of the radial velocity of the host star. If a star is in a binary system, it will orbit the center of mass of that system. To an external observer, this means the star will periodically move towards and away from the observer. The amplitude of this variation depends upon the mass of the binary companion as well as the orientation of the plane of the stars orbit with respect to the observer's line of site. In the case of the Sun-Jupiter system, Jupiter has sufficient mass that it causes a 12-13 meter/second variation in the space motion of the sun. Here is the data, obtained with a precision of 11 meters/sec that shows the radial velocity variation, indicating the presence of a small companion, in this case, a Jupiter size object.